The last two days of the 2017 ITTF World Junior Circuit Swedish Junior and Cadet Open, 25th and 26th February 2017, will witness some of the youngest table tennis players on earth in action. Amongst them is Egypt's Hana Goda, a nine year old young lady, passionate for table tennis and a hard worker; already an achiever for her age. As a 12 year old young boy, the legendary magician of table tennis, Jan-Ove Waldner played the Safir International for the first time. His face hardly reached the table and some of his opponents complained “it’s difficult to defeat someone you can’t see”. But history repeats itself, and some of the players at the Swedish Junior and Cadet Open too, just like Waldner, just reach the edge of the table. One such player is Egypt’s Hana Goda who is participating at the Swedish Junior and Cadet Open for the third time and is still the youngest player in the tournament! Born on 12th December 2007, Hana Goda is currently only nine years old. “I love training and I love playing. Even if I lose, I try to learn,” said Hana Goda. Her coach has been extremly supportive so far. He says,“the road to win includes a lot of losses on the way”. Goda has been to Sweden a couple of times for practice and to play smaller tournaments. “I train four hours a day, at home, where we have a table, or in my club.”- Hana Goda, the youngest female player at Swedish Junior and Cadet Open. When asked about her goals for Swedish Junior and Cadet Open, pat came the answer, “I hope to win the Mini Cadets,” said Hana Goda in an enthusiastic note. However, later in the day Hana lost to a strong defender from Russia,Vasilisa Danilova, who is also two years elder to her. Danilova beat Hana in straight games (11-9, 11-6, 11-4) in their round of 16 match. The eligibility for Mini Cadet events is “Born on or after January 1st, 2004” which means, players 13 years old and younger can take part in this prestigious tournament. 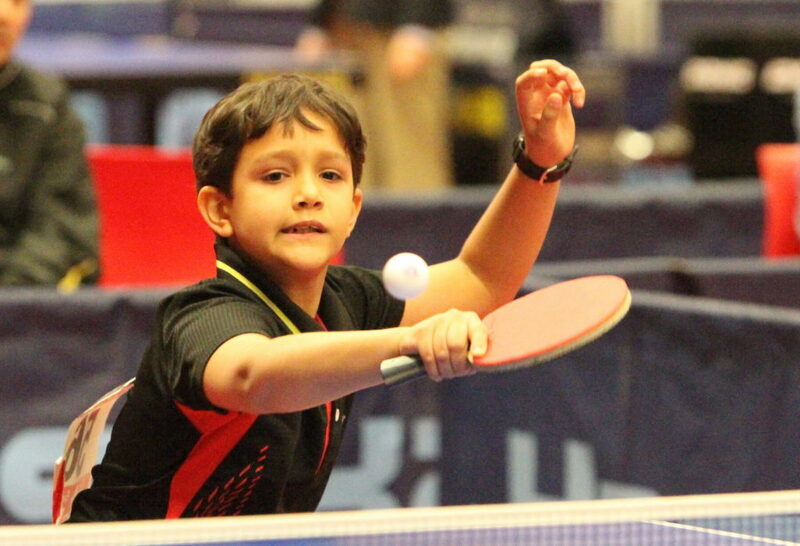 The youngest male player here, Rafael Cabrera from Dominican Republic, born on 30th March 2007, is also nine years old. He played a lot of close matches but failed to reach the main rounds. However, being the youngest of all, if Cabrera too dreams like Hana, he will be back, maybe not as the youngest, but surely the one with a bit more experience. Hana Goda and Rafael Cabrera might have lost earlier in the tournament, but, at only nine years of age, their passion to play the sport, their desire to win every match and their ability to work hard makes them special. At Orebro, they haven’t won a medal, but they definitely won millions of hearts. Additionally, you might wonder, are these two young players Tomokazu Harimoto, the youngest World Junior Champion, in making?